There’s less than a month left in the spring semester, and for those with meal plans who overestimated their hunger earlier in the year, that means you’ve got some meal points to burn. While all Penn Staters love a warm cookie from the buffet at West, we’re lucky enough to have awesome restaurants on campus that accept meal points. Hibachi-San is located right in the HUB, and is a favorite for its freshly made sushi and miso soup. The Japanese restaurant is a favorite among students, but that ultimately was its downfall in this ranking. Hibachi-San is so popular that it typically has a huge line during peak meal times. The food is clearly top-notch, but the wait makes it inconvenient for a quick lunch between classes. Grate Chee is another HUB classic, serving up grilled cheese and tomato soup. A popular special on Tuesdays is the “spagwich,” which is a sandwich made with garlic bread, spaghetti, and mozzarella cheese. It’s great for grilled cheese lovers, but the specialized menu means it can’t do much for you if you aren’t craving a spagwich. Panda Express is a solid option for HUB diners. Its seating area is slightly outside the craze of the main tables if you actually want to hear the people you’re eating with. Open until 9:30 p.m., it’s a solid spot for Chinese food all day long. Right by Panda Express is every mall’s favorite pizza place. The specialty pizza slices are interesting to try, and the pasta comes in huge servings. Sbarro’s best feature is its separation from the rest of the HUB. You can squeeze your whole friend group in a comfy booth and enjoy Italian classics. Nittany Lions with fast food fever can chow down on burgers and fries right on campus. The cheap prices are a major draw, especially on weekends when Late Night deals are in effect. The menu is huge, meaning Burger King is the place to go when you want anything from a milkshake to a breakfast sandwich. The nuggets and fries can’t be beaten, especially when you can use meal points or LionCash to pay for them. Unfortunately, the HUB’s Chick-Fil-A is a smaller version of the regular fast food chain, meaning the menu is limited only to the most basic items. If you want Chick-Fil-A for lunch, you’ll have to decide for yourself if the salty waffle fries are worth the inevitable line. In 2019, you can’t have a college campus without a Starbucks. The baked goods and coffee are the favorite of basic girls for a reason. Best of all, there are multiple locations right on campus, so you’re never far from a frappuccino. With three locations here, Au Bon Pain is Starbucks’ less crowded little sister. The sandwiches, soups and salads are all yummy, cheap and fast. The teas and coffee can give you a kick start before class. In the Kern building’s location, there are cozy study spots with outlets under most tables. A major perk of such a huge campus is that there’s a food option for everyone. Did VALLEY get your favorite? Tell us in the comments! With winter on its way, dried, chapped lips are inevitable. Lip balms are a great way to keep your lips moist and beautiful during the harsh winter months. 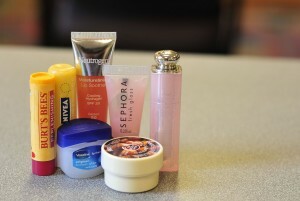 However, there are many misconceptions about lip balms that should be cleared up before the weather turns cold.